A sudden downpour, a feeling of exhaustion walking up Park St and a grumpy housemate who couldn’t decide on what to eat are the factors that led to a visit to Nando’s on Saturday. The last unsuccessful attempt was five years previously when we first moved to Bristol. Unlike our local Nando’s the Park St branch had been quite grubby with dirty cutlery and unpleasant chicken. There wasn’t much to recommend it back then but maybe it was time to try again. The service was prompt, polite and informative. Our menus were handed over with some key points to remember about choosing the food then selecting a flavour / heat of sauce. There is mango and lime or lemon and herb, then the spice increases to medium, hot and extremely hot. There are many dishes which include chicken, a few sides as accompaniments and some vegetarian dishes. I chose the 1/4 chicken with two sides of peri peri chips and coleslaw. 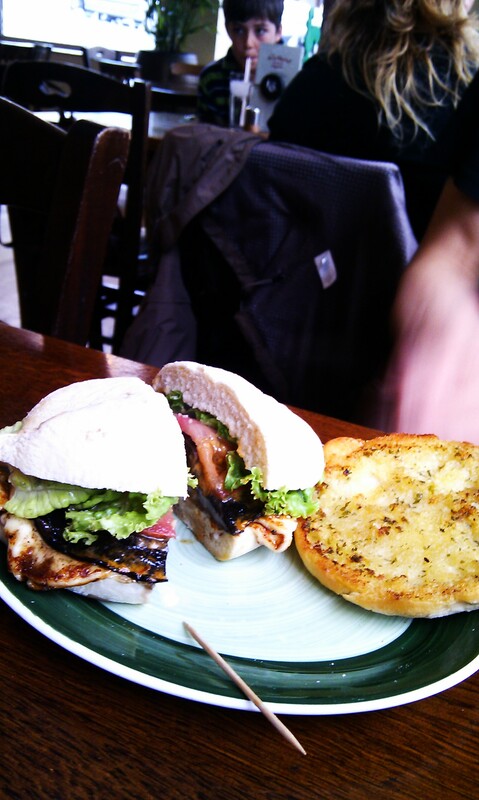 My friend Graeme for some reason chose a haloumi and portobello mushroom burger and a side of garlic bread. The food was brought out in under 10 minutes (it is fast food after all) and wasn’t too bad. The chips were great and so was the coleslaw. The chicken was nice and tasted chargrilled although it wasn’t hugely substantial. It would have been a fine meal if Graeme’s dish wasn’t so tiny that he insisted on sharing his garlic bread in exchange for half my chips, a bargain I regretted very quickly. The food was relatively cheap with my meal at £6.45 and Graeme’s at £6.25. His beer at £3.15 was a little dear for a small bottle but not unexpectedly so. 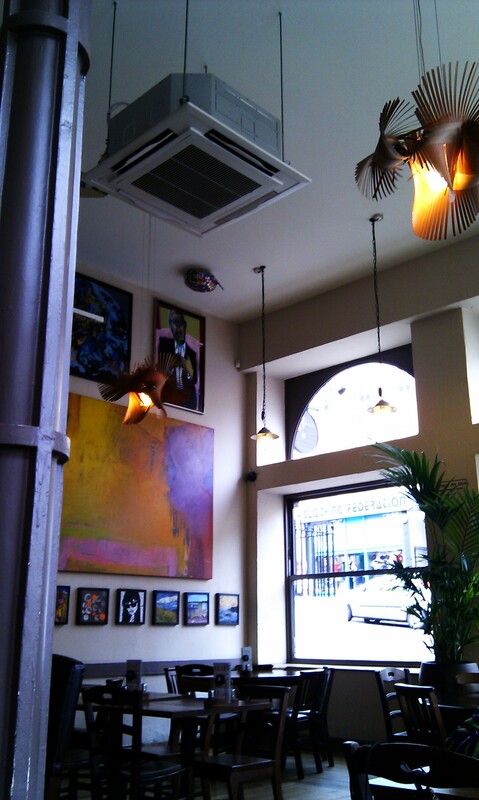 I enjoyed the little Saturday diversion, the building is nice and the cutlery was clean. 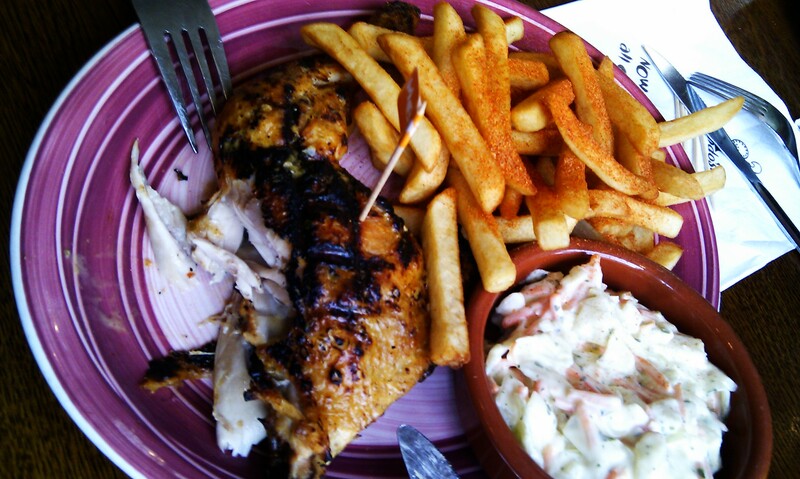 The food was brought out quickly and all tasted pretty good with the peri peri chips being particularly good. We didn’t try any of the ice cream or the mixed olives which have previously been lovely. The website also offers further information the available dishes so my 1/4 chicken provided 317 calories and 15g of fat, my chips were 340 calories with 14g of fat (well, half of that) and the coleslaw was 304 calories with 28g of fat. I’m not so sure I wanted to know. Update: After asking about the taste of the burger I was told that apparently the mushroom was slippery and the haloumi was thinner than expected but it was very tasty. This entry was posted in Bristol, Food, Restaurants and tagged Bristol, Bristol restaurants, fast food, Nando's, Park St. Bookmark the permalink.